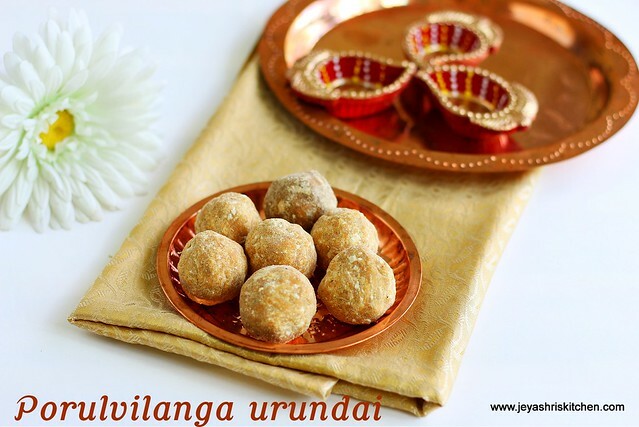 Porivilangai urundai | Porulvilanga urundai (recipe with video) is a healthy multigrain ladoo recipe made with jaggery for sweetness, and generally we don't use ghee for this recipe. 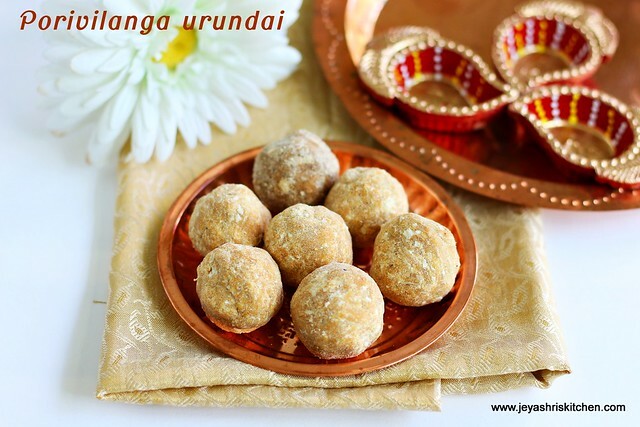 This urundai is generally hard and we break with hammer or keep it inside our mouth for a while and it gets softened. I think most of the South Indians have a good memory associated to this porulvilangaai urundai. I have noticed this recipe in amma's hand written cookery notebook. She always keep a note of all recipes she learn through our relatives and tv shows. Whenever i go to there i will have a glimpse of those recipes, but i never find time to note the recipes down. This particular porulvilanga urundai recipe is taught by my athai and she had noted down the recipe too. When i wanted to try this, i called her up and asked her for the measurements. The urundais turned out perfect. If you don't have flour mill nearby, you can try with kanji maavu | sathu maavu too. In a pan dry roast the rice till it turns reddish brown colour. Roast this in a low flame. Keep it aside. Add the Samba wheat also and roast this well. Ensure not to make it burnt. You can use whole godumai too. Next add the yellow moong dal and roast it till it changes nice brown colour. You can replace with whole green gram dal too. Finally add the channa dal and roast it to perfect golden brown. Always roast in a low flame and stir continuously. If you have a flour mill nearby, grind this into a fine powder in the mill itself. If you have patience to grind in the mixie go ahead and grind in the mixie. Grind, sieve and again grind till you get a smooth texture. The whole quantity of ingredients yielded 3 cups of flour( approx.). I took 1/2 cup from that to make this porulvilanga urundai. If you want to make more, make it in small batches. The jaggery syrup you can make but do not mix everything together at a stretch. When it is gets cooled, you can not make the balls. In a pan dry roast the fresh coconut till the moisture leaves and turns nice golden brown. Roast in a low flame. Keep this along with the flour. You can use dry coconut (kopra)too and just saute for few seconds and add. If using kopra, grate them in a small grater. In a pan add 1/2 cup of powdered jaggery. Use good paagu vellam for this. Add 1/4 cup of water and melt the jaggery. Filter for impurities. Add this back to the pan and add the sukku powder and cardamom powder. Boil the syrup till it reaches soft ball consistency. To check this, take few drops of jaggery syrup and drop it into a small bowl of water. If you bring this together and make a soft ball the consistency is perfect. For making karthigai pori urundai we have to bring it to hard ball consistency, which is the next stage. If you make hard ball syrup for this, it is difficult to bite this after making the urundai. Once the syrup is ready add the syrup to the flour and roasted coconut mixture. Mix well quickly using a spoon. It will be warm as we are mixing it with flour. So go ahead and start making urundais/ balls out of it. Be fast in action while making the urundais. If it becomes cold, it is difficult to make balls. Always make this in batches. You can add a portion of roasted peanuts, almonds to the mixture while making the flour. Rice can be replaced by millet too. You can make the same with sathu maavu too. Some people roll the urundais on dry flour after making the balls. You can do it if you feel it is moist. Thank You so much for posting this recipe..during my childhood days I have eaten this but unfortunately I did not know what it was called.. I'm definitely gonna try. Thank You once again.